In my previous post, I looked at how Liverpool seemingly focussed upon crossing last season and how it was on the whole unsuccessful, at least in open-play. One thing that I noted was that crossing from set-pieces appeared to be more successful in terms of goals scored than crosses in open-play. The average number of crosses per goal scored last season was 79 in open-play and 28.3 from a set-piece. Crossing accuracy is also higher for set-pieces (33.9%) compared with open-play (20.5%). This demonstrates that crossing is more effective from set-pieces than in open play. So the question is: Which teams were particularly efficient at scoring from set-play crosses and how did this contrast with their open-play performance? As with the crosses from open-play analysis, there are several under and over-performers in terms of crosses from set-pieces. Furthermore, some teams score a large proportion of their goals from crosses. 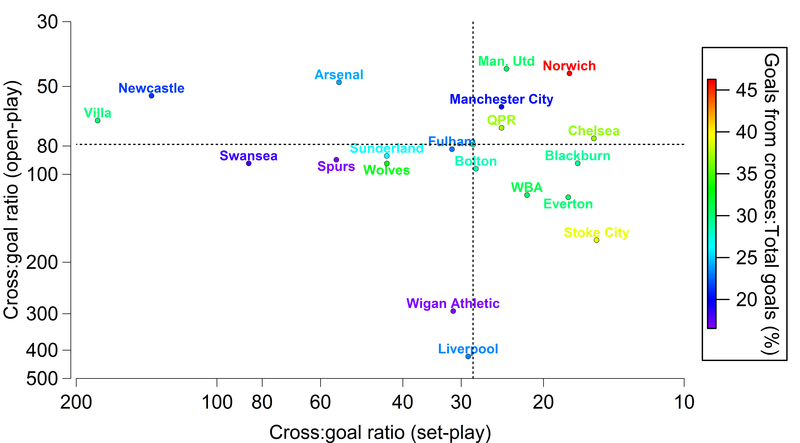 Relationship between the number of crosses in open-play required to score a goal from a cross in open-play and the number of crosses from a set-play required to score a goal from a cross at a set-play for English Premier League teams in 2011/12. Note that both scales are logarithmic and that they are reversed as a larger number is worse. The horizontal dashed black line indicates the average number of open-play crosses required to score a goal from a cross in open-play across the league, while the vertical dashed black line indicates the number of crosses from a set-play required to score a goal from a cross at a set-play. The teams are coloured by the percentage amount of goals they scored from all crosses, relative to their total number of goals. Data is provided by Opta and EPL-Index. Stoke conformed to their stereotype here as they led the way marginally from Chelsea, as they required 15.4 crosses per goal at a set-piece compared to Chelsea’s 15.6. Chelsea scored 14 goals in total from set-pieces, while Stoke scored 10. Other notable performers were Blackburn (16.9), Norwich (17.6) and Everton (17.7). Norwich were probably the most efficient crossing team in the league last season, as they scored frequently compared to their peers from both open-play and set-pieces. In fact, 46% of their goals came from crosses last season, ahead of Stoke (39%), QPR (37%) and Chelsea (37%). Whether such numbers will be sustainable next season could be crucial for Norwich under Chris Hughton. Aston Villa (180), Newcastle (138) and Swansea (85.5) were the clearest under-achievers, as they only scored 4 goals from a set-piece cross between them. In contrast to their severe under-performance in the open-play crossing analysis, Liverpool were about average as far as set-piece crosses were concerned. Indeed, Liverpool scored 9 goals from set-piece crosses last season, which was joint third with Blackburn, Everton and West Brom. One of the aspects of crossing that I find curious is the poor success rate of crosses in terms of their accuracy. At first glance, the accuracy of crosses appears to be uniformly low; 23.4% for all crosses, with Arsenal posting the lowest (21.5%) and Norwich having the highest (27.3%). Accuracy is even worse in open-play, where it drops to 20.5% on average last season. Norwich are again the highest (24.8%), while Bolton had the lowest (17.2%). The overall crossing accuracy figures are skewed by the greater accuracy from set-piece crosses, which on average were accurate 33.9% of the time. Newcastle had the lowest accuracy with 23.9%, which was far lower than any other side (Liverpool were next lowest with 29.1%). Such a low accuracy goes some way to explaining their poor efficiency from set-piece crosses. The contrast to this is Aston Villa, who amazingly had the highest set-piece cross accuracy with 41.7% but could only score 1 goal from a set-piece cross all season. This greater range and contrast in crossing accuracy when they are broken down potentially points towards a level of granularity in the crossing data, that is not separated by the coarse definition of crosses used here. Ideally, the crosses would be separated by the position from which the cross originated, along with defending and attacking players positioning. EPL-Index include “byline crosses” in their crossing database, which is a start as it shows that such crosses are far more accurate on average (47.8%). If we assume that successfully crossing to a team-mate is the first stage in potentially creating a chance to shoot and subsequently scoring, then it would appear that byline crosses are a far better option than other crosses in open-play; open-play crosses excluding these byline crosses have an accuracy of 19.7%. Sadly I don’t have enough information available to assess whether byline crosses are a more efficient means of scoring from a cross plus the sample size is relatively small compared to total open-play crosses on a team-by-team basis. Some teams essentially never get to the byline and cross the ball; Stoke attempted only 2 byline crosses all season. Only Manchester City (50), Arsenal (47), Liverpool (34) and Manchester United (31) really attempted enough to draw even tentative conclusions. However, it would make sense if such crosses were a more effective means of scoring from a cross as they are often attempted closer to goal, which may result in an easier chance for the receiver. Based on last season, set-piece crosses are a more efficient means of scoring than open-play crosses. There are likely a multitude of reasons for this, one of which is possibly the superior crossing accuracy from set-pieces compared to those in open-play. The greater parity in numbers between attackers and defenders could be another reason plus the more specialised headers of the ball, such as centre-backs, could be used to greater effect at set-pieces. One potential method of extracting more value from crosses is to attempt them closer to the byline, where the accuracy is far greater than other open-play crosses but at present I don’t have enough data to fully explore this idea. Overall, scoring from a cross does not appear to be a particularly efficient and direct method of providing goals. However, it could be argued that a goal may indirectly result from a cross; the “in the mixer” approach, although this is likely to be particularly subject to the vagaries of luck and is more applicable to set-pieces. Based on last season, a team will on average score a goal from a cross in open-play every 79 crosses. Even the best performers in the league needed 45 crosses on average to score a single goal. The average number of open-play crosses per game attempted by a team last season was 17, which suggests that over the long-term, a team can expect to at best score a goal from an open-play cross every 2-3 games. Crossing, especially in open-play, appears to be a low-yield method of scoring. If Liverpool had been merely average last season, the 841 open-play crosses they attempted would have yielded an extra 8 goals. If they had been exceptional, they could have expected another 16 goals. The question is whether this is a good enough return to motivate basing your playing style upon over the long-term? This entry was posted in Crossing, English Premier League, Liverpool and tagged Arsenal, Aston Villa, Blackburn Rovers, Bolton Wanderers, Chelsea, Crossing, EPL, Everton, Fulham, Liverpool, Manchester City, Manchester Utd, Newcastle Utd, Norwich City, QPR, Shooting, Stoke City, Sunderland, Swansea City, Tottenham Hotspur, West Bromwich Albion, Wigan, Wolves by Will Gurpinar-Morgan. Bookmark the permalink.